The Governor of the Central Bank Patrick Honohan told the Oireachtas Finance Committee that ‘it was notable, though perhaps not surprising’ that banks have pursued this option. ALMOST TWO-THIRDS of banks’ letters to mortgage holders in arrears threatened repossession, according to the governor of the Central Bank. Honohan was facing questions from politicians at the Oireachtas Finance Committee today and revealed that, of the almost 35,000 “solutions proposed” by banks, 62 per cent referred to the surrender of the property, while 38 per cent proposed further restructuring. He told the committee that a sustainable solution for homeowners in arrears is ‘one that is affordable for the borrower in both the short and the long term’. Any arrangement, he added, “must provide sufficient clarity on what happens to the collateral at maturity’. The first, preferred, type of solution is an arrangement where payments are re-established on the original, or an agreed revised schedule. The second mode is where the borrower opts for a Personal Insolvency Arrangement under the PIA. This was not yet available to borrowers at end-June. The third mode, available to the bank only where an arrangement could not be reached or is not appropriate, involves surrender or repossession of the property. Honohan said “it was notable, though perhaps not surprising” that banks have in most cases pursued the third option. Earlier this month the CEOs of the four major Irish banks faced the committee and were asked about their progress in finding ‘sustainable solutions’ for struggling homeowners. The revelation that legal letters sent to those in arrears constituted reaching Government targets caused consternation among committee members but the banks said they had the approval of the Central Bank. Honohan said today that the Central Bank had agreed with this approach to account for cases where a bank had not had any communication from a borrower in a number of years. In these cases the bank has no way of coming up with another solution, he said. Honohan added that results of audits on mortgage agreements for mortgage arrears will be known in November and will be published at the end of the year. Email “Honohan: Banks threatened repossession in 62 per cent of 'sustainable solutions'”. 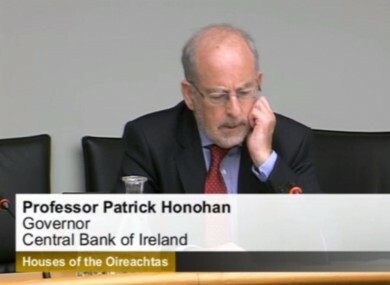 Feedback on “Honohan: Banks threatened repossession in 62 per cent of 'sustainable solutions'”.